We have a good selection of German Expressionist prints. This includes works by artists from Die Brücke (The Bridge) school such as Erich Heckel, Karl Schmidt-Rottluff, Max Pechstein and Edvard Munch are offered here. We offer prints from the Berlin Secession group of artists, which included Kathe Kollwitz, Hermann Struck, Lyonel Feininger and Lovis Corinth. 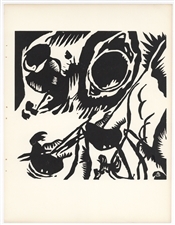 Many other printmakers associated with German Expressionism are also featured, such as Heinrich Campendonck, Felix Meseck, Max Kaus, Rudolf Grossmann, Alexander Kanoldt, Andre Rouveyre, Ingaz Epper, Karl Hofer, Edwin Scharff, Max Beckmann, Georg Ehrlich, Conrad Felixmuller, Richard Seewald, Karl Rossing, Kurt Schwitters, Max Burchartz, Otto Dix, Heinrich Nauen, Eberhard Viegener, Walter Ruttmann, Franz Hecht, Wilhelm Plunnecke, Paul Kleinschmidt, Karl Caspar, Otto Gleichman, Ernst Barlach, Max Unold and Richard Seewald. Der Blaue Reiter (The Blue Rider) group centered around Franz Marc and Wassily Kandinsky, who is a favorite at AffordableArt101. Although German Expressionist printmakers employed various media, they excelled especially at the introduction of the woodcut into Modern Art. 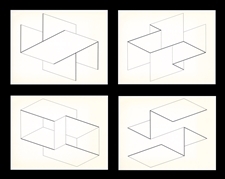 The Bauhaus School was an important offshoot of Expressionism, and we are pleased to include Bauhaus artists Josef Albers, Lyonel Feininger and Paul Klee. Medium: original woodcut. Catalogue reference Dube 264 IIIB. This striking woodcut was published in 1920 for Genius. Image size: 10 1/8 x 6 3/4 inches (258 x 170 mm), on wove paper with full margins. Signed in the block (not by hand). A richly inked impression! Condition: there is minor waviness and age-toning to the margins. 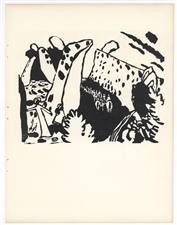 This original Erich Heckel woodcut is from GENIUS: Zeitschrift für Werdende und Alte Kunst. This art and literary project only lasted three years, but had incredible influence on German art and culture between the Wars. Some of the important artists contributing original prints included: Karl Schmidt-Rottluff, Richard Seewald, Franz Marc, Erich Heckel, Frans Masereel, Max Kaus, Karl Hofer, Alexander Archipenko, and others. This was a major vehicle for the German Expressionists. 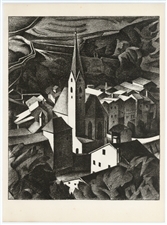 Alexander Kanoldt original lithograph "Klausen in Tirol"
Medium: original lithograph. This striking lithograph was published in 1922 for Genius. The image size is 11 1/4 x 9 1/4 inches (285 x 235 mm), printed on wove paper. This original Alexander Kanoldt lithograph is from GENIUS: Zeitschrift fur Werdende und Alte Kunst. This art and literary project only lasted three years, but had incredible influence on German art and culture between the Wars. Some of the important artists contributing original prints included: Karl Schmidt-Rottluff, Richard Seewald, Franz Marc, Erich Heckel, Frans Masereel, Max Kaus, Karl Hofer, Alexander Archipenko, and others. This was a major vehicle for the German Expressionists. Not signed. Condition: there are a few small spots of foxing in margin, as shown in the second photo. Medium: original etching. Signed in pencil by Rudolf Grossmann and printed in Germany in 1922 for the very rare "Die zweite Ganymed-Mappe" portfolio of "Das vierte Jahrbuch der Marees Gesellschaft", published in Munich by Marees-Gesellschaft, R. Piper & Co. This impression is one of the deluxe signed edition of 300 printed on cream wove paper. The plate measures 6 5/8 x 5 inches (167 x 127 mm); a fine impression with full original margins. Paul Klee serigraph "Figure of the Oriental Stage"
Medium: serigraph (after the 1934 oil painting on fabric). This serigraph was printed in 1941 by the Creative Printmakers Group and issued by the Nierendorf Gallery of New York. The serigraph measures 10 x 7 1/2 inches (250 x 190 mm) and was mounted by the publisher along the top edge onto a larger support sheet. Signed by Paul Klee in the plate; not hand-signed. Condition: there are a few scratches to the surface. This is a magnificent, richly inked impression. Medium: original etching and drypoint. The English translation of the German title is "The Hug". Published in Leipzig, Germany by Zeitschrift fur bildende Kunst in 1915. The plate measures 7 x 6 1/4 inches (180 x 160 mm). This is a very rich, dark impression on heavy wove paper. Not signed. Max Klinger original etching "Die Quelle"
Medium: original etching and aquatint. Catalogue reference: Singer 325. Published in Vienna by Gesellschaft für Vervielfältigende Kunst in 1896. The plate measures 6 1/8 x 4 3/4 inches (155 x 120 mm); the total sheet is 10 1/2 x 5 1/2 inches (165 x 142 mm). A fine impression printed on wove paper. Not signed. Condition: there is minor creasing; also, the margins have been trimmed and there is foxing in the margins, not affecting the etching. Medium: original etching and drypoint. Printed on cream wove paper and published in Leipzig, Germany by Zeitschrift fur bildende Kunst in 1916/17. Their inscription is printed at the bottom of the sheet, which demonstrates the provenance. The plate measures 10 1/8 x 5 inches (258 x 125 mm). This piece is in the permanent collection of The Brooklyn Museum, of New York. A nice, rich impression. Not signed. 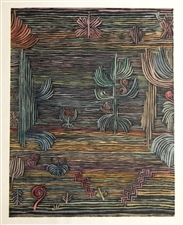 Paul Klee large pochoir "Jardin Exotique"
Medium: pochoir (after the watercolor). Printed in Paris at the atelier of pochoir master Daniel Jacomet (the date of printing is unknown). The image size is 18 1/2 inches x 14 1/2 inches (470 x 365) and the full sheet measures 24 x 19 inches. Not signed. 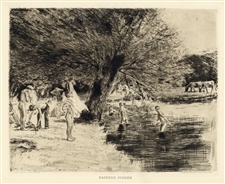 Max Liebermann original etching "Badende Jungen"
Medium: original etching and drypoint. Also called "Badende Knaben". The catalogue reference is Schliefler 43. Published in Vienna by Gesellschaft für Vervielfältigende Kunst in 1896. The plate measures 9 1/4 x 11 1/2 inches (233 x 295 mm). A fine, dark impression printed on wove paper with full original margins. Not signed. Lovis Corinth original etching "Der Ritter"
Medium: original etching. Published in Leipzig, Germany by Zeitschrift fur bildende Kunst in 1914/15. Their inscription is printed at the bottom of the sheet, which demonstrates the provenance. The plate measures 5 5/8 x 4 1/8 inches (143 x 105 mm); with full original margins. Not signed. Lovis Corinth original lithograph "Weiblicher Halbakt"
Medium: original lithograph. Catalogue reference: Schwarz L 419. This original lithograph was executed by Lovis Corinth for "Gesammelte Schriften", published in Germany in 1920. The image size is 7 3/4 x 6 inches (195 x 155 mm) and the total sheet measures 11 1/8 x 8 1/4 inches (283 x 210 mm). This is a nice impression on thin laid paper. Not signed (the lithograph is titled in the plate "v. Habermann", probably referring to the model). Buy authentic and affordable Expressionist artwork online at Affordable Art 101, where you can see a well-rounded display of Expressionism in art. Our selection here heavily focuses on German expressionists, like Kandinsky, Franz Marc and more. If you’re searching for prints, woodcuts, etchings, lithographs or more by Expressionist artists – we are your online supplier. Many of our authentic pieces are one-of-a-kind, hard-to-find works of art for the true Expressionism enthusiast. Whether you’re an art dealer or simply a fan of the Expressionism style in art, browse our vast online gallery.